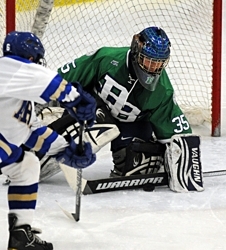 Blake's Devon Johnson has split time in nets with Ryan Hayes this winter (Photo by Tim Kolehmainen). The rest of Section 2A probably doesn't want to hear it, but the race to state looks like it will go through Breck and Blake again this winter. The two Tri-Metro private schools have combined for the last five state bids (Blake went three straight years from 2006-08 and Breck won the past two state titles in 2009-10). And both are currently in the top-five in the Class A rankings this season and a perfect 6-0-0 in the Tri-Metro. Most Class A fans have been pointing to this game as perhaps a changing of the guard, as Breck graduated much of the team that led it to consecutive state titles. During that same time, Blake was reloading with a young team that is now filled with seniors. Blake coach John Hamre has kept his team focused on smaller goals so far this winter, which has led to a 13-2-2 record (a perfect 12-0-0 against Class A schools). "Our focus is our team, just improving one game at a time," Hamre said over the holidays. The Bears have been consistent and have great depth on the roster. It begins up front, where seniors George Ordway (15-21-36) and Donald Chute (15-13-28) lead the team in goals. Freshman Spencer Naas (9-11-20) has been a great addition to the front line and gives the Bears a youthful presence, along with junior Zach Doerring (6-11-17) and Christopher Chute (8-6-14). Having great hockey bloodlines doesn't hurt, either. The Chute brothers' older sisters Katharine and Margaret play DI hockey at Harvard. Doerring's older brother Blake was also a star at Blake and is playing for Des Moines (USHL). Defensively, the Bears are solid, as they only allow 2.12 goals per game. Dartmouth-recruit Ryan Bullock (7-14-21) is elusive with the puck and has great playmaking ability as the leader of the unit. Goaltenders Ryan Hayes (7-2-2, 2.47 goals-against average, .889 save percentage) and Devon Johnson (6-0-0, 1.52, .905) have split time in nets. David Zosel has been one of the Mustangs' many goal-scoring threats, as Breck is averaging 6.64 goals per game (Photo by Tim Kolehmainen). While Blake has many familiar names returning, Breck (9-5-0) virtually started anew after winning back-to-back state titles. "When you do lose 14 guys who played for you, that's a lot. But I'm pleasantly surprised with how these guys have stepped up," Breck coach Les Larson said. "If you run with race horses long enough, you're going to turn into a race horse." Larson proved that point by challenging the new-look Mustangs in the Schwan Cup Gold Division over the holidays. While they lost all three games to Class AA powers, Larson called it a "character builder" and stated that the Mustangs didn't expect to win every game this winter. That may be, but Breck is certainly going to win more than a fair share of games. Perhaps the biggest challenge is finding a steady influence in nets after the graduation of John Russell, who backstopped both state titles. Larson has given time to a trio of goaltenders thus far. Last year's backup, Max McCormick (4-3-0, 2.86, .848), has seen the most time, but Jack Kenney (2-2-0, 2.26, .903) and Cooper Stainbrook (3-0-0, 1.12, .939) have also started several games. The Mustangs have produced 6.64 goals per game with an offense that includes state tournament veterans such as Conor Andrle (11-25-36), Grant Opperman (14-18-32) and Wesley Iverson (15-9-24) along with newcomers Thomas Lindstrom (11-13-24) and Matt Colford (8-13-21). Rugged Austin Rudnick (6-12-18) anchors the blue line crew, which includes Shayne Ciernia and eighth-grader Keegan Iverson. The winner of this game gets a leg up in the rough-and-tumble Lake Conference standings. Minnetonka has already surprised with victories over Hopkins and Edina so far, pushing the Skippers back into the discussion as one of the best teams in the state. After a slow start -- perhaps not surprising with the graduation losses they faced -- the Skippers have won eight of their last nine games. Sophomore Vinni Lettieri leads the way with 12 goals. Wayzata -- other than two losses to Moorhead -- has been a juggernaut. The Trojans already have a victory over Edina and a tie to Eden Prairie in the Lake and arguably outplayed both teams. All hands are on deck for this rematch between two teams that have combined for the past 14 Section 8AA titles -- and seem to be well in line for a 15th straight (with apologies to Bemidji, of course). Roseau won the first meeting (2-1 on Dec. 14), but the Spuds have won five straight games while only allowing four goals. Goaltender Michael Bitzer is among the best in the state and can singlehandedly win a game for Moorhead. Roseau has been streaky, losing its first five before ripping off a seven-game winning streak. But the Rams have dropped their last two games -- 4-1 to Warroad and 7-3 to Bemidji. Could this be the changing of the guard in Section 5AA and the Northwest Suburban Conference? Blaine has been the bullies on the block for the past five years, winning every section title in that stretch. Maple Grove has been on the losing end of several hard-luck playoff losses to the Bengals, but seem to have the favorite's role this winter. The two teams tied at 2-2 back on Dec. 9. Since then, the Crimson have gone 9-2-0 and are allowing just 1.69 goals per game, largely on the strength of a stout defense and goaltender Ryan Coyne. Blaine won't go away easily, though. Despite an upset loss to Centennial, the Bengals have won five of six games, three by shutout. These two Classic Suburban Conference rivals enter this game as the top-ranked team in each class (Hill-Murray in Class 2A and St. Thomas Academy in Class 1A). That only magnifies the status of this game, which already is one of the best in the state. Hill-Murray has won five straight since an early January loss to Eden Prairie. The Pioneers seemingly have no weaknesses, as they can boast of an experienced goaltender (three-year starter Tim Shaughnessy), strong defense and a deep offensive lineup. St. Thomas Academy just received a big four-goal effort from Matt Kroska in a 5-4 victory over Breck, which earned the Cadets the top spot in Class 1A over Hermantown and the two-time defending state champion Mustangs. This is a very important game for both teams to prove they belong among the best in the state. Each plays in a conference it has dominated in recent years (Holy Angels in the Missota, Benilde in the North Suburban), which allows them to build up a winning record, but without many signature victories. This would be one. Holy Angels is a young club that has been up and down (as evidenced by a recent victory over Eden Prairie. but losses to Hill-Murray and Minnetonka). Benilde is also young, but has been cleaning up in NSC action lately (a combined 32-2 score in the past three victories). The top four teams in the Lake Conference are all among the best in the state, and three of the four have spent at least some time at No. 1 in the rankings. Interestingly, the one that hasn't is last year's Class 2A state runner-up, Minnetonka, which began the Lake schedule with victories over Edina and Hopkins and currently sits atop the standings. The Skippers have been surging, while Eden Prairie hasn't won in three games (0-2-1), tying Wayzata and losing to Holy Angels and Duluth East. The Eagles remain dangerous, though, particularly the top line of Mark and David Rath and Mr. Hockey favorite Kyle Rau. They've combined for 39 of Eden Prairie's 74 goals. If someone is going to break Warroad's stranglehold on Section 8A, it's likely to come from these two contenders. Both have already beaten the Warriors (Thief River Falls won 2-1 in overtime on Jan. 20 and East Grand Forks won 3-0 on Dec. 17) and will square off two more times this winter. The Prowlers have adjusted their game after the graduation of All-State goaltender Zane Gothberg. They're scoring more (Micah Ranum leads the way with 14 goals), but also allowing a few more. East Grand Forks has been more close to the vest, but has a top line of Zack Lawdermilt, Tommy Hajicek and Cory Mack that can play with anyone. The trio has combined for 29 of the team's 59 goals. If there is going to be a challenger to Hermantown in Section 5A, this might be the last chance for one to make a statement. Proctor is just 4-4-1 since opening the season on a roll, but the Rails have been dealing with injuries and haven't been at full strength much of that stretch. 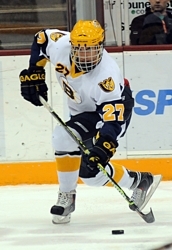 The Rails have some talented snipers such as Justin Scanlon, Cody Gauthier, Ian Ecklund and Tyler Pionk that can put plenty of pressure on Hermantown's tough defense. The Hawks finally lost their first game (6-2 to Bemidji) after opening the season 15-0-1. Hermantown just might come back with an edge, which could be tough for the Rails to match. So might Garrett Skrbich and Jared Thomas, who have combined for 42 goals. It's been tough to know what to make of these two South Suburban Conference teams so far this winter. Both are separated by just one point for second in the conference race (behind Burnsville), so this could be a game to sort out their realities. Apple Valley hadn't had a signature victory until upsetting Duluth East last Tuesday, but the Eagles were widely considered a state tournament contender because of youngsters such as Hudson Fasching, A.J. Michaelson, Derek Smith and Vince Pedrie. Bloomington Jefferson has some signature wins (such as beating Eagan on Jan. 15), but also some head-scratching losses. The two teams met in the season opener on Nov. 30, with Apple Valley claiming a 6-3 win.